microRNAs (miRNAs) are endogenous, small (18-25 nucleotides), non-coding RNAs that are negative regulators of gene expression at the post-transcriptional level [1-3]. With sequences partially complementary to their target mRNAs, miRNAs play vital roles in regulating (mostly inhibiting) gene expression in various organisms [1, 4]. miRNAs are transcribed in the nucleus by RNA polymerase II and processed by the endonuclease, DROSHA, in the nucleus. The pre-miRNA is then exported to the cytoplasm and processed by DICER. The resulting mature miRNA sequence is incorporated into the RNA silencing complex (RISC). Within the RISC, the miRNA guides the complex to its RNA target, thereby mediating its repression. The target selectivity is dictated by the miRNA “seed” sequence located within nts 2-8 at the 5'-end of the mature miRNA sequence. The seed sequence binds through Watson-crick base pairing within the 3' untranslated region (3' UTR) of the target genes, leading to translational repression of the target mRNA by either transcript destabilization, translational inhibition or both. Since the first miRNA, lin4, was discovered 10 years ago , thousands of miRNAs have been identified in organisms, and studies have confirmed that they participate in a variety of biological processes (such as development, proliferation, cell growth, and metabolism) largely through inhibiting mRNA translation [4, 6]. Recent studies suggest that the expression of approximately 20-30% of human genes is regulated by miRNAs . Two different mechanisms have been proposed for the pathogenesis of spinal cord injury (SCI): a primary mechanical injury and a secondary injury induced by multiple biological processes, including inflammation, excitotoxicity, apoptosis, and demyelination [7-10]. Alterations in the expression of many genes have been shown to play vital roles in the pathogenesis of secondary SCI [7, 8]. In addition, demyelination, a process inducing neuronal death, gradually increases after SCI and during the secondary injury, and may perpetuate the nerve conduction deficits . These pathophysiological changes may continue for several years after injury and cause strong suppression of spontaneous neuronal precursor neurogenesis, finally leading to the paralysis. To develop effective treatments is a major focus in studies on SCI, and great efforts have been made to improve the functional deficits of SCI patients, including paralysis . Several therapeutic approaches have been used to improve the microenvironment of the injured spinal cord and/or to stimulate the endogenous repair in an attempt to ameliorate secondary injury [9, 11, 13, 14]. Although a majority of studies has focused on compounds with neuroprotection against secondary injury in SCI, their therapeutic efficacy remains controversial . A more recent review summarizes the miRNA dysregulation in the SCI . Bioinformatics analysis suggests that the altered expression of these miRNAs may contribute to the pathogenesis of secondary SCI . These findings are exciting in that they might reveal potential targets for the therapy of SCI [16-18]. To determine the expression patterns of miRNAs in adult mice, 13 different areas were dissected from the central nervous system (CNS) of adult mice (spinal cord, cerebellum, medulla oblongata, pons, mesencephalon, thalamus, hypothalamus, hippocampus, amygdala, neocortex, olfactory bulb, eye and pituitary gland) and the miRNA profiling was performed . Of interest, many miRNAs show extremely high enrichment in specific regions, suggesting that they might be associated with certain functions. In agreement with some previous reports, mouse brain was rich in miR-9, miR-124a, miR-125b, miR-127, miR-128, and members of the let-7 family. The medulla oblongata exhibited the enrichment of miR-34a, miR-451, miR-219, miR-338, miR-10a, and miR-10b, and miR-195, miR-497 and miR-30b were highly expressed in the cerebellum . The hypothalamus showed accumulation of miR-7 and miR-7b . miR-218, miR-221, miR-222, miR-26a, miR-128a/b, miR-138, and let-7c were enriched in the hippocampus. miR-375, miR-141, miR-200a, miR-375, miR-7, and miR-7b were highly expressed in the pituitary . miR-10a and miR-10b were enriched in the spinal cord . To investigate the specific roles of miRNAs in the CNS, many studies have ablated Dicer, which is critical for the miRNA biosynthesis because its loss can result in embryonic lethality [24, 25]. Studies have shown that, during the early CNS development, deletion of Dicer in the neural crest (NC) may lead to the cell loss in the sensory, enteric, and sympathetic nervous systems . During the late embryonic stage, Dicer affects the survival and differentiation of cortical neural progenitor cells, leading to the deviant migration of cortical neurons . Ago, a part of the RNA-induced silencing complex [27, 28], also plays important roles in the CNS development. For example, neural tube closure is prevented in mice with Ago mutation . Existing evidence indicates that miRNAs are important for the CNS development and function. To understand changes in the expression levels and the corresponding regulatory functions of miRNAs following SCI, it is necessary to elucidate how miRNAs work under normal conditions. Previous reports have shown extensive miRNA expression in the spinal cord of adult mice . Liu et al further demonstrated that approximately 77% of identified rat mature miRNAs were expressed in the spinal cord of adult rats; microarray analysis revealed that 269 of 350 miRNAs were detectable in the adult rat spinal cord, and 36 were expressed with the signal intensities greater than 10,000 . With regard to spatial distribution of miRNAs in spinal cord, both Bcl-2 and miR-9/9* were more abundantly expressed in the dorsal part of the sacral cord, while P53 and miR-124a/125b were more highly expressed in the ventral spinal cord and dorsal root ganglia (DRG). In addition, after the treatment with all-trans-retinoic acid (RA) in spinal bifida rat fetus, the Bcl-2 and miR-9/9* expression dramatically reduced in the dorsal sacral cord and P53 and miR-124a/125b expression dramatically reduced in the ventral spinal cord and DRG. These findings suggest the possible relationship between the expression changes of miR-9/9*, miR-124a, miR-125b and the expression of Bcl-2 and P53 during the spinal cord development . As mentioned above, microarray analysis revealed the expression of nearly 300 kinds of miRNAs changed in the adult rat spinal cord following SCI, and significant change was noted in 97 miRNAs. Of 97 miRNAs, 60 had the signal intensities greater than 500. These miRNAs can be classified into three categories according to their expression patterns: 1) up-regulated miRNAs, 2) down-regulated miRNAs, and 3) miRNAs with bidirectional changes in their expression post-SCI (Table 1). The expression of remaining 37 miRNAs with the signal intensities lower than 500 also significantly reduced after SCI, but they did not exhibit specific patterns. The expression of 172 miRNAs remained unchanged after SCI . Similar results were observed in another microarray study on SCI in rats, in which the expression of 343 miRNAs changed following SCI . Interestingly, another group employed real-time reverse-transcriptase polymerase chain reaction (qRT-PCR) and in situ hybridization to investigate miRNAs, and results showed that the impact of SCI on miRNA expression persisted up to 14 days and expanded both anteriorly and caudally around the injured site; in addition, there was a direct correlation between the number of affected miRNAs and the SCI severity . To investigate the expressional changes in miRNAs following SCI is the first step in understanding the relationship between miRNAs and SCI. miRNAs can be subdivided into hundreds of families with presumably independent origins . It has been known that different members of the same miRNA families can simultaneously target several categories of genes and act together to regulate specific physiological processes . For example, members of the let-7 family are expressed highly in rat spinal cord after chronic constriction injury . A bioinformatics analysis revealed that the potential targets for these miRNAs include genes involved in many pathophysiological processes, such as inflammation, apoptosis and oxidation after SCI [16, 31]. Another study revealed that some mRNAs of inflammatory mediators, such as intercellular adhesion molecule 1 (ICAM-1), interleukin-1β (IL-1β) and tumor necrosis factor-α (TNF-α), were potential targets of miR-181a, miR-411, miR-99a, miR-34a, miR-30c, miR-384-5p and miR-30b-5p , miR-486 , which were down-regulated post-SCI, and miR-17 and miR-20 , miR-124a , which were up-regulated post-SCI, and miR-124a, which was down-regulated at 1 and 7 days post-SCI . On the other hand, some mRNAs of anti-inflammatory mediators, such as TRAF6, annexin A1 and A2, were likely targets of miR-146a [31, 32], miR-223 [31, 36], miR-221  and miR-1 [16, 32], which were up-regulated post-SCI, and miR-1, which was down-regulated at 3 days post-SCI [31, 36]. Furthermore, mRNAs of cytosolic phospholipases A2 (cPLA2) and secretory PLA2 (sPLA2) are likely targets of miR-181a and miR-127, which are down-regulated post-SCI . A recent study demonstrated that SCI-induced PLA2 activation also plays an important role in the pathogenesis of secondary SCI . Some miRNAs that are up-regulated post-SCI (such as miR-1, miR-206, miR-152, and miR-214) may target anti-oxidant genes, including superoxide dismutase 1 (SOD-1) and catalase genes . In recent years, apoptosis has been identified as a vital mechanism of cell death in many neurological diseases and SCI [38-40]. Apoptosis related genes like caspase-3, calpain 1, calpain 2, Bcl-2, c-Myc and apoptosis-inducing factor (AIF) genes become potential targets of miR-138 , miR-124 [16, 32], miR-235-3p, miR-137 and miR-30b-3p , which are down-regulated post SCI, and miR-1 [31, 32], miR-15b, miR-34 and miR-145 , which are up-regulated post SCI. However, anti-apoptosis related genes, including Bcl2-1 and Bcl2-2 genes, are potential targets of miR-21, miR-146a [31, 32], miR-20a [15, 16], miR-145, miR-214, miR-674-5p, miR-15b, miR-17, miR206 and miR-672 , which are up-regulated after SCI. In addition, miR-103, miR-107 , miR-133a , miR-133b [16, 41], which also have influence on the apoptosis, have an up-regulated expression at 4 h post-SCI and a subsequent down-regulated expression at 1 and 7 days post-SCI. It is worth mentioning that let7/miR-98 and miR-133b exhibit both pro-apoptotic and anti-apoptotic effects . microRNAs showing increased or decreased expression following SCI in animal models. The expression of several miRNAs is up-regulated/down-regulated at 4 h, which sustains for several days. In addition, the expression of several miRNAs start to up-regulate/down-regulate at 1 day, 4 days, 7 days or after 7 days. A considerable body of researches shows that miRNAs can influence SCI through various pathways, including apoptosis, regeneration, inflammation and demyelination . This has been described in detail in a recent review . In this paper, we focus on the clinical importance of miRNAs in SCI. In available studies, most are carried out in animals, especially in rats. Although some findings are obtained from animal models, they may also offer evidence and indispensable directions to carry out further studies. The prognosis of the SCI, as shown in animal models, can be classified into three types: improvement, deterioration and improvement and thereafter deterioration. In this section, we focus on the outcome of SCI. It has been found that miRNAs and mRNA have no one-to-one relationship: one miRNA can target many mRNAs and a mRNA can also be regulated by many miRNAs . In this case, the expressional changes in miRNAs and the corresponding clinical manifestations may become a good reference for future clinical studies. According to the different expressional changes in miRNAs and the prognosis following SCI, these miRNAs may be classified into three main groups: protective, detrimental and varied. Anti-inflammatory and anti-apoptotic effects of miR-17-92 cluster (miR-17 and -20), miR-146a, and miR-138 in SCI. In one study, the expression of protective miRNAs, which have anti-apoptotic capability, was investigated in SCI, such as miR-17-92 cluster (miR-17 and -20), miR-146a and miR-138  (Figure 1). Studies have shown that miR-34a can directly inhibit the expression of anti-apoptotic proteins Bcl-2 and XIAP. The increase in caspase-11 following miR-34a over-expression indicates that miR-34a may be related with apoptosis by reducing the expression of anti-apoptotic proteins . However, in SCI, miR-34a expression is significantly down-regulated, which suggests that miR-34a protects against cell death because anti-apoptotic protein expression remains at a high level. miR-384-5p expression is continuously down-regulated following SCI. Interestingly, cleaved caspase-3 expression is up-regulated by miR-384-5p and down-regulated by an miR-384-5p inhibitor, suggesting that miR-384-5p plays an important role in regulating signaling pathways, such as the apoptotic pathway. Regardless of the identified pathways, it is clear that miR-384-5p down-regulation is protective on SCI. Evidence has shown that the miR-181a is associated with the modulation of inflammatory pathways, and the up-regulated miR-181a following SCI, may exert anti-inflammatory effects via down-regulating IL-1α. Furthermore, the suppressed expression of several inflammatory factors, such as IL-1β, IL-6 and TNF-α, may also result from the influence of miR-181a mimics . Another study shows that the expression of miR-181 family is down-regulated because of inflammation. Genetic studies also reveal that miR-181 family can inhibit the production of pro-inflammatory cytokines, such as TNF-α, IL-6, IL-1β, IL-8, LIF, and HMGB1, but promote the generation of anti-inflammatory cytokines (IL-10) . 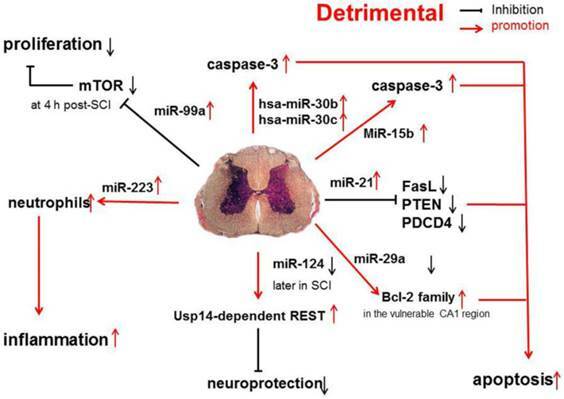 Recent evidence shows that miR-30b, miR-30c, miR-223, miR-15b, miR-1, miR-145, miR-17-92 cluster (miR-17 and -20) and hsa-miR-106a may promote the progression of SCI  (Figure 2). A functional screening using novel small RNA expression libraries leads to the identification of hsa-miR-30b and hsa-miR-30c as negative regulators of cell death induced by loss of attachment (anoikis). Importantly, the acquisition of anoikis resistance via these miRNAs is achieved through down-regulating caspase-3 expression. Thus, down-regulation of hsa-miR-30b and hsa-miR-30c expression may result in secondary SCI . Pro-inflammatory and pro-apoptotic effects of miR-30b, miR-30c, miR-223, miR-15b, miR-1, miR-145, miR-17-92 cluster (miR-17 and -20) and hsa-miR-106a in SCI. A study on miR-20a shows that miR-20a expression shows an up-regulation at 24 h after SCI, which sustained for 1 week . Ngn1, a key protein that can maintain the cell survival and neurogenesis, may be inhibited by miR-20a, and to block miR-20a expression in SCI animals is effectively to induce neuronal survival and neurogenesis . It has been shown that miR-223 is highly expressed at 12 h after SCI. In situ hybridization and immunohistochemistry showed the signals of miR-223 merged with Gr-1-positive neutrophils. Existing data indicate that miR-223 might regulate neutrophils in the early phase of SCI when there is a cascade of secondary damage to the spinal cord. miR-223 is expressed in the neutrophils that relocate to the epicenter of inflammation after SCI, and inflammatory cytokines are also highly expressed at the same time. Izumi et al found that miR-223 promoted the neutrophil-mediated inflammation following SCI . miR-15b enhances the hypoxia/re-oxygenation-induced apoptosis of cardiomyocytes via the mitochondrial pathway of apoptosis. Inhibition of miR-15b increases the protein expression of Bcl-2 without affecting Bcl-2 mRNA expression, suppresses the release of mitochondrial cytochrome into the cytoplasm, and decreases the caspase-3 activity . However, whether the highly up-regulated miR-15b enhances hypoxia/re-oxygenation-induced apoptosis in SCI remains to be elucidated. The effects of miR-1, miR-145, miR-17-92 cluster (miR-17 and -20), hsa-miR-106a on SCI were described in a previous study . Some miRNAs may affect several pathways, are expressed in different regions, and have altered expression at different time points after SCI (e.g., early up-regulation at 4 h post-SCI followed by down-regulation at 1 and 7 days post-SCI). Thus, these siRNAs may exert varied effects under distinct conditions, and thus we classified them into the third group. miR-21 is involved in both proliferation and apoptosis pathways. In SCI, elevated expression of miR-21 and decreased expression of miR-199a-3p correlate with significant changes in the expression of their target genes: mTOR (mammalian target of rapamycin) mRNA expression increases. Western blotting assay confirmed similar change in protein level . An increase in phosphorylated-S6 (a downstream effector of mTOR) in intermediate gray neurons in Ex rats was blocked by rapamycin, suggesting that activity-dependent plasticity in the injured spinal cord is modulated in part through miRNAs that regulate mTOR signaling and may indicate an increase in the regenerative potential of SCI affected neurons . In addition, pro-apoptotic genes for Fas ligand (FasL), phosphatase and tensin homolog (PTEN), and programmed cell death protein 4 (PDCD4) have been shown to be direct targets of miR-21 in many diseases and cell types. In vivo, treatment with antagomir-21 increases the expression of FasL and PTEN, demonstrating that miR-21 down-regulates the expression of these anti-apoptotic genes following SCI . Astrocyte-enriched miR-29a targets PUMA and reduces neuronal vulnerability to the forebrain ischemia. Available data suggest that, by targeting a member of pro-apoptotic Bcl-2 family, to increase miR-29a might emerge as a protective strategy against ischemia-reperfusion injury. Notably, miR-29a significantly increases in the resistant dentate gyrus but decreases in the vulnerable CA1 (cornu ammonis 1) region of the hippocampus, which results in different effects . 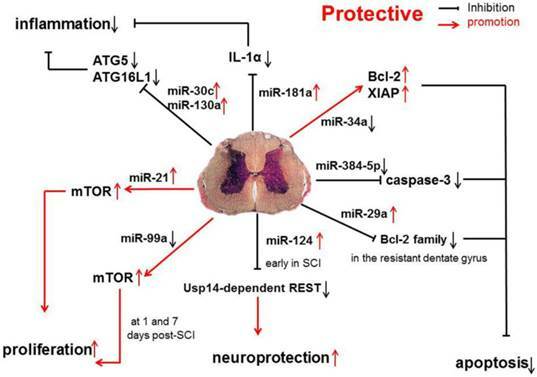 miR-124 protects against focal cerebral ischemia, and ectopic miR-124 expression appears to be an attractive and novel tool in the stroke treatment and may exert neuroprotection via an unknown mechanism involving the Usp14-dependent REST degradation. miR-124 expression increases at initial stage, and decreases later following SCI, indicating that the protection afforded by miR-124 is transient . With an early up-regulation at 4 h post-SCI followed by a down-regulation at 1 and 7 days post-SCI, initial over-expression of miR-99a suppresses the expression of mTOR by directly targeting its 3' un-translated region (3' UTR) in a post-transcriptional manner. In this way, miR-99a inhibits the cell proliferation by suppressing mTOR . At later stages of SCI, a decrease in miR-99a expression will promote the spinal cord recovery by releasing the inhibition of active mTOR pathway . Abnormal miR-21 expression has been reported in many different human diseases (mostly cancers), and increased miR-21 expression has been found to be associated with the increased cell survival, growth and proliferation and decreased apoptosis [56-59]. Previous studies have shown that miR-21 expression is significantly up-regulated in many CNS diseases, such as traumatic brain injury (TBI), and is related to the TBI-induced pathophysiology, including apoptosis and neuronal plasticity . miR-21 expression initially increases around the lesion 4 days after SCI and then reduces. The transiently elevated miR-21 expression in conjunction with the simultaneous re-expression of nestin (a neural progenitor factor) suggest a protective role of miR-21 in facilitating cell survival and integration of neural progenitor cells at the injury site, which is in accordance with previous findings that miR-21 usually functions as an anti-apoptotic factor by inhibiting the expression of PDCD4 and pro-apoptotic protein PTEN [61, 62]. In another animal model, miR-21 expression also increased significantly at 5 weeks after SCI . miR-21 is expressed mainly by cultured astrocytes [63, 64], and thus to study the role of miR-21 in astrocytes after SCI, transgenic mice with miR-21 over-expression or knockout were used. Results showed that over-expression of miR-21 in astrocytes reduced the hypertrophic response to SCI. On the other hand, inhibition of miR-21 in astrocytes led to the increased axon density within the lesion site . Together, these findings demonstrate a novel role of miR-21 in SCI recovery. Notably, a short-term exercise after SCI leads to a significant increase in miR-21 expression, leading to reduced structural and functional deficit after initial injury, which will be discussed later . Similar to miR-21, miR-486 expression increases at 7 days post-SCI in a murine contusion model. Studies have demonstrated that infusion of miR-486 into the spinal cord of healthy mice decreases the motor function and increases the neuronal death. Conversely, knocking down miR-486 in a mouse SCI model improves the hind limb functional recovery . The major target of miR-486 in the motor neuron is NeuroD6, which is an important protein for neuronal differentiation and the oxidative stress response . NeuroD6 induces the expression of glutathione peroxidase 3 (GPx3) and thioredoxin-like 1 (TXNL1) in the lesioned spinal cord, which effectively scavenges excessive reactive oxygen species (ROS) and attenuates inflammation in SCI . Based on these findings, a promising therapeutic strategy for SCI might be the inhibition of miR-486 by up-regulating NeuroD6 expression, which significantly decreases the apoptosis and improves the SCI-induced functional deficits. A SCI model of adult zebrafish shows the extreme up-regulation of miR-133b expression in regenerating brainstem neurons after spinal cord transection . Antisense morpholino (MO) induced inhibition of miR-133b expression attenuates the locomotor recovery and reduces the axonal regeneration. miR-133b targets RhoA, the expression of which is significantly up-regulated following SCI , and inhibition of RhoA facilitates the corticospinal tract repair and exerts neuroprotection by decreasing tissue damage after SCI [68, 69]. Studies have shown that miR-133b serves as an important determinant in the spinal cord regeneration in the adult zebrafish by reducing RhoA protein expression , making miR-133b and RhoA attractive therapeutic targets in SCI. As a non-invasive therapy for SCI, exercise is beneficial for maintaining the muscle mass of paralyzed hindlimbs , the stabilization of rhythmic firing patterns of spinal motoneurons  and the improvement of functional recovery . Evidence has demonstrated that a short-term exercise leads to a significant increase in miR-21 expression and a decrease in miR-15b expression. A long-term exercise has no effects on the miRNAs expression . miR-21 functions as an anti-apoptotic factor in SCI by inhibiting the expression of pro-apoptotic proteins PTEN and PDCD4 . Similar mechanisms are also found in the miR-15 and miR-16, which directly influences the Bcl-2 expression, facilitating the caspases-3, -7 and -9 dependent apoptosis . Thus, non-invasive exercise may influence multiple miRNAs that target genes regulating caspase expression, resulting in decreased apoptosis. Studies have demonstrated the possibility of scanning cerebrospinal fluid (CSF) and blood for identification of miRNA biomarkers of diseases and injuries. Circulating miRNAs may serve as biomarkers when their expression changes. For instance, the expression of multiple miRNAs has been found to change in some brain regions and blood in rats with ischemic stroke . A study also shows that plasmic miR-124 increases in rats after brain injury . Further work is needed to examine the usefulness of these miRNAs as SCI biomarkers. A recent study inspires us to make a right diagnosis: the distribution characteristics of miRNA-positive cells and miRNAs can be detected in related regions. For example, miR-9 expression is up-regulated in miR-9-positive cells of the ventral horn and dorsal horn of the spinal cord after injury . Moreover, the changes in the expression of miRNAs may become promising biomarkers for predicting the severity of SCI. With the different compressing power worked on spinal cord, the expression of miR-9*, miR-219 and miR-384-5p is up-regulated by different degree in the serum following the SCI . In this way, we can judge the severity of SCI by testing the expression of miRNAs. However, further study should be done in clinical trials. The possibility of using miRNAs as therapeutic reagents has drawn high attention, because of their capability to modulate gene expression though tuning their expression . While RhoA (a protein with highly up-regulated expression following SCI) has been known as a therapeutic reagent for SCI, miR-133 may down-regulate the RhoA expression . miRNAs with the ability of molecular suppression may become novel reagents for the neuranagenesis after SCI. Studies on miRNA mimics for SCI patients are lacking, but these molecules might be effective on SCI. As mentioned above, miRNA and its mimics have the advantage of small size, and administration of a miRNA mimetic may increase the endogenous miRNA and repress the expression of detrimental genes. Besides, with current knowledge of miRNA biogenesis, modified RNAs can be clinically delivered as synthetic, pre-processed miRNA oligonucleotides . Several studies have described the potentials of certain kinds of anti-miRNA molecules targeting specific pathologic miRNAs in vitro and in vivo [77, 78]. For example, a study showed si-miR-20a treated rats had significantly decreased size of lesions and compromised blood clotting , which shows that to inhibit miR-20a expression may prevent inflammation-mediated secondary injury and also simulate neurogenesis. Although anti-miRNA molecules have been effectively delivered to many tissues, including the CNS , and whether these molecules at high doses and administered in different ways are still effective in vivo are required to be confirmed in future studies . Up-regulating or down-regulating the expression of major target genes may exert similar effects as inhibition of miRNAs . Existing studies demonstrate that SCI can induce extended miRNA dys-regulation that is parallel to the changes in mRNA expression and affects the key processes of SCI, including inflammation and apoptosis. Collectively, available findings suggest that targeting miRNA dys-regulation is an attractive therapeutic strategy for SCI. In this review, we discuss the changes in miRNAs following SCI and the physiologic and pathologic effects of these alterations. The miRNAs in adult rats can be classified into three categories according to their alterations in the temporal expression following SCI: 1) miRNAs with up-regulated expression, 2) miRNAs with down-regulated expression, and 3) those with an early up-regulation at 4 h and a subsequent down-regulation at 1 and 7 days post-SCI. Moreover, miRNAs appear to exert protective, detrimental and varied effects on SCI. However, current understanding of the mechanisms underlying the pathogenesis of SCI is still limited, and additional miRNAs remain to be discovered. More studies are required to investigate the functions and targets of SCI-related miRNAs. microRNAs showing varied changes in their expression following SCI in animal models. Several miRNAs show varied changes in their expression and the varied time can be the 1 day or the 7 days after SCI. The authors thank Dr. Dong Zhenhua, Jiang Jianhao and Zhao Kai for their reviewing the manuscript. This work was supported by the National Natural Science Foundation of China (No. 81401014 M.H. ), the Young Scientists Awards Foundation of Shandong Province (No. BS2013YY049). Corresponding author: Zhe-Yu Chen, Department of Neurobiology, Shandong Provincial Key Laboratory of Mental Disorders, School of Medicine, Shandong University, Jinan, Shandong 250012, PR China; E-mail: zheyuchenedu.cn.